After writing such high praise on the Protocase Designer software — which Protocase shared via their Facebook page and Twitter — I was torn on writing this next segment, but I must in order to be completely honest about my experience building this project. Plus if I’ve had a questionable experience with a company, I’ve made it a point to write about it: CaseLabs (here), Performance PCs (here, here, and here), FrozenCPU (here), Amazon (here), FedEx (here and here), AquaTuning/AlphaCool and their insurance company… I believe in being honest about my experiences — and where I’ve previously talked about a problem I’ve had, I’ve not only said what the problem was, but how it was resolved. So too it is now with Protocase. Before continuing, I need to fill in some other side details. 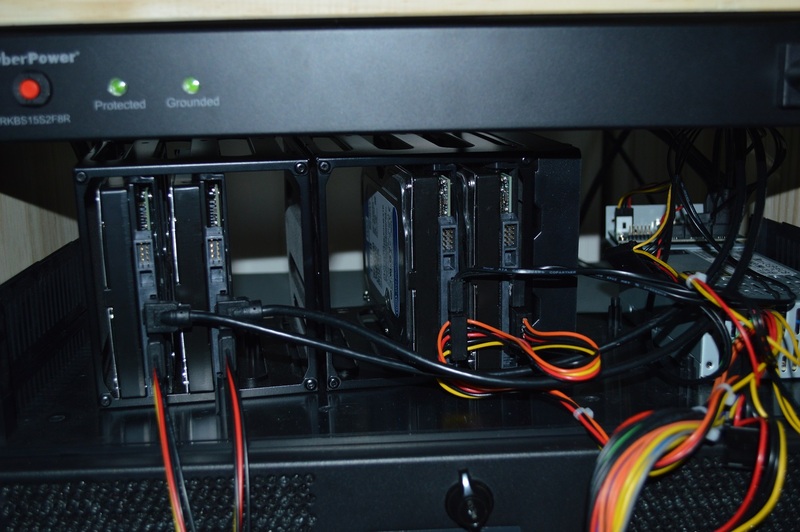 While trying to figure out what I’m going to do for an enclosure, I’ve since got a proof of concept together for the internal components: I have 4x1TB WD Blue hard drives connected to the Addonics port multiplier and connected to my computer via eSATA, powered by a FlexATX power supply. The hard drives are configured for RAID 10 as I’d planned — I’ll elaborate more on how I got that set up later (hint: it didn’t involve the SIIG RAID card I’d been using). What prompted me to make that move a little sooner than expected was some hard drive corruption that unfortunately caused me to lose the original file I’d sent in to receive that quote. So I decided to build the proof of concept, partly as a test to make sure everything was going to work. After getting the RAID setup and everything re-installed, I re-downloaded Protocase Designer and rebuilt the file. Allow me to shine a bit more praise on the Protocase Designer: it only took me about 20 minutes to build out the new file from scratch to what I originally had, mostly thanks to the cutout library. That’s a bit of a disparity! The design team took a look and at the present time we don’t see any major concerns, this is not to say there wasn’t some type of error when you recreated your file. We did have a minor concern which was addressed immediately. You may have created your design when this was happening. We do apologize for this. The second price is a more accurate price. If the design is needed I can work with you on the price. We can honour the price for you this time . If you would like to call I would be more than happy to talk to about this. During the course of the conversation, I had made a couple additions to the design — the original design didn’t have any way out the back to exhaust the air, so I added a few 60mm fan mounts. In having made the changes, I proposed a new offer: 175 USD for the work and setup, plus shipping — which would bring it to shy of 200 USD. Basically I was taking advantage of the fact they were willing to honor the original quote, but since I’d made modifications, I proposed something a little higher. Quote No. 38273, quoted at 299.92 USD plus setup with free shipping. Contrast that with the original quote of 79.38 USD plus setup and another 18 USD for shipping. Yeah there was definitely something not right when I got the original quote. Let’s briefly segue into the RAID 10 setup. In a parenthetical above, I noted that the RAID is not going through the SIIG card I had installed. One thing not mentioned in the manual or anywhere is that it will not allow you to create a RAID including drives on a port multiplier. So I have it going through my mainboard’s BIOS. I had to turn off the RAID’s caching options as well to keep it stable — with caching turned on, it would periodically crash and eventually got to a point where the RAID controller kept telling me 3 drives were offline. There is a slight performance penalty turning off caching, but it’s not anything serious. I created a backup image of the new installation using Macrium Reflect, which showed read throughput of over 2.5 Gb/s — note that’s nearly a 70% improvement over the specified sustained read rate for the WD Blue. Still slower than an SSD, but I think SSDs are overrated anyway. And if anyone wants to challenge me on that, feel free, as I can tell you my experience with using an SSD heavily on a software engineering computer for the last 3, approaching 4 years. It’ll probably change your perspective on how good they actually are. Unfortunately her boss was expected to be out of office till Friday, so I inquired if there was someone else to whom she could forward the proposal to be reviewed. I wasn’t on a time crunch for this, and the proof of concept was holding stable, but if things could get turned around sooner, then I’d go for sooner — especially since they have a 2 to 3 day lead time once the design goes into production. She also stated in her e-mail that the design would also need to be forwarded to the design team for review, which is part of their procedure. The next morning, the representative decided to not wait and instead gave the necessary authorizations while making sure to document why she was selling me a custom enclosure for what amounts to a 40% discount. The order was pushed through with a total of 193 USD — 175 USD plus 18 USD for shipping. The order has gone through all necessary approval steps and should now be going into production. I’ll update the series when I have the enclosure in hand, which will probably be toward the end of the week. Production should take two to three days and be shipped by 2-day shipping.